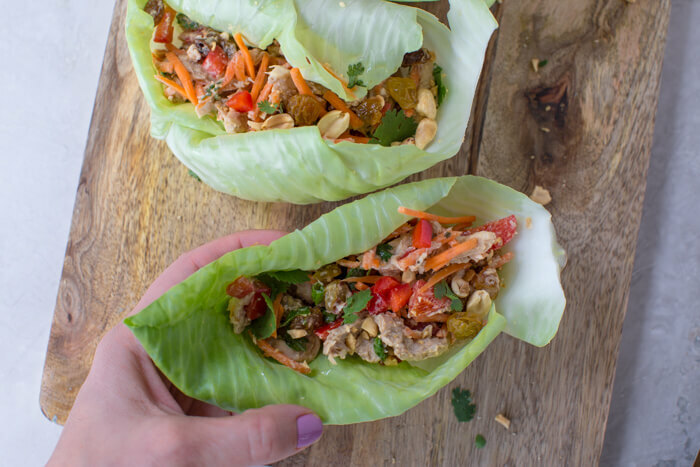 Thai Chicken Salad Lettuce Wraps! 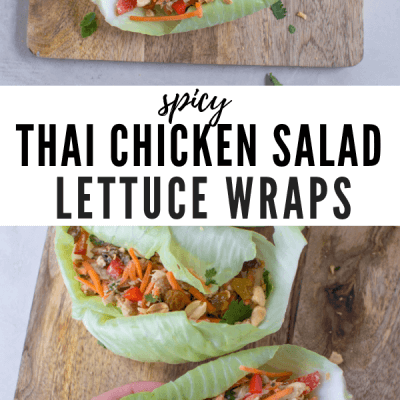 These lunch wraps are spicy and made with peanuts for a cold Thai chicken recipe wrapped in lettuce. These wraps are the real deal! 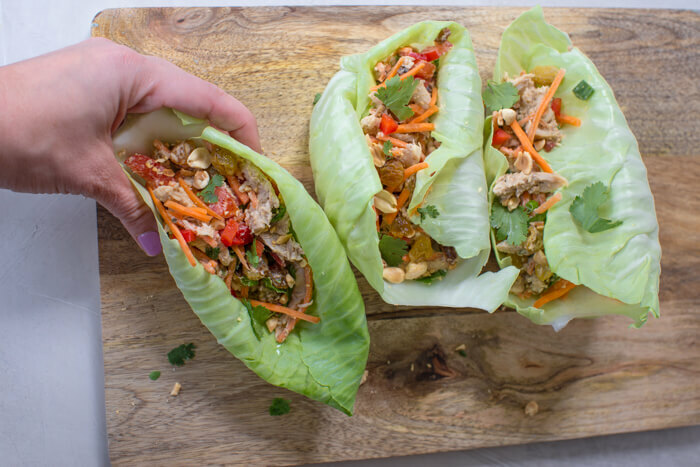 Made with clean and wholesome ingredients, these lettuce wraps can easily be tossed together for a simple meal that’s packed with nutrients. 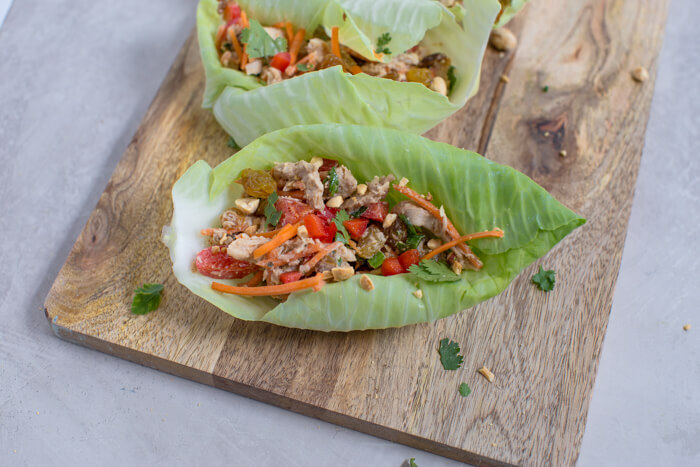 Not only do I love the simplicity of this Thai Chicken Recipe, but I’m also a huge fan of the veggie boost they give me. I don’t know about you, but I’m on the struggle bus when it comes to getting a sufficient amount of veggies in my diet throughout the day. 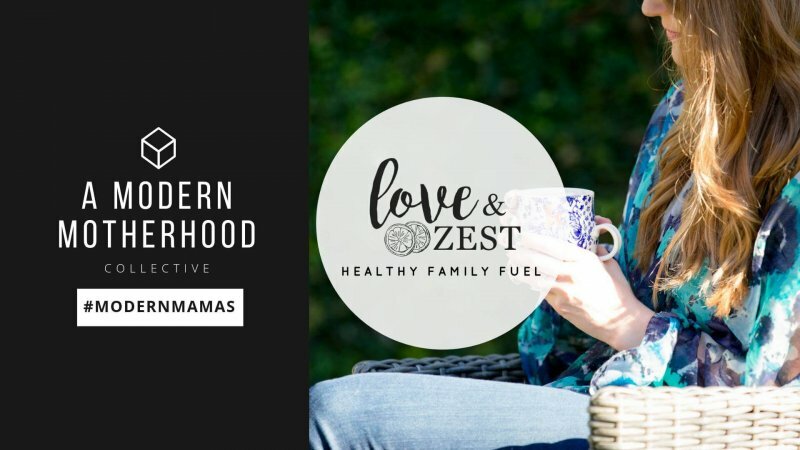 Yep, even dietitians need more veggie love. My intentions are great but sometimes it just doesn’t happen. That’s where these babies come in! The carrots, cabbage, and bell pepper are great additions that you wouldn’t normally find me standing around snacking on. 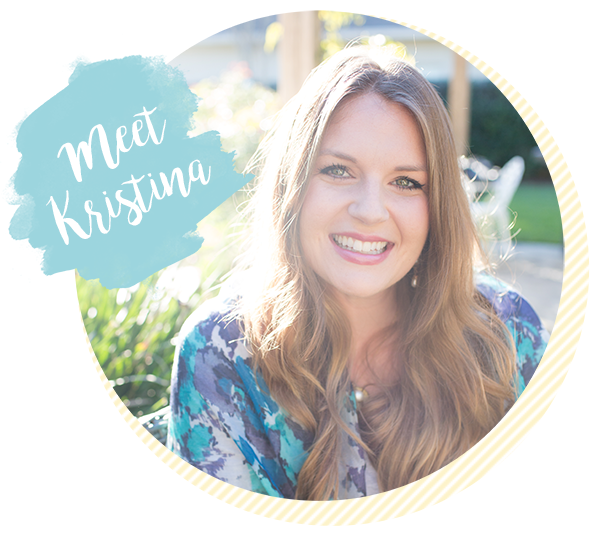 These wraps will leave you feeling satisfied and energized so you can tackle the things on your to-do list! Also I should mention the flavor of these lettuce wraps. PURE HEAVEN! The combination of sweetness from the honey & peanut butter and savory from the soy sauce simply can’t be beat. Not to mention the crunchiness from the peanuts and fresh veggies – YUM! Speaking of the flavor of this recipe, it reminds me of the Panera Bread Spicy Thai Salad, which is BOMB! Have you ever tried it?? Let’s chat through the nutrition of that Panera Bread salad and see how it compares to my recipe. So compared to the lettuce wraps, the Panera Bread Spicy Thai Salad has slightly more protein and is also higher in calories and carbs likely because of the dressing. Looking for more carbs? Serve this Thai Chicken Recipe between two slices of bread. You can even pile this chicken salad on top of some leafy greens for an extra veggie boost! Nutritious and easy lunch are the name of my game. Chicken salad is always a good idea and I love trying out new recipes with different flavor combinations. And who doesn’t love a Thai chicken recipe?! I hope you’ll enjoy these as much as I do! 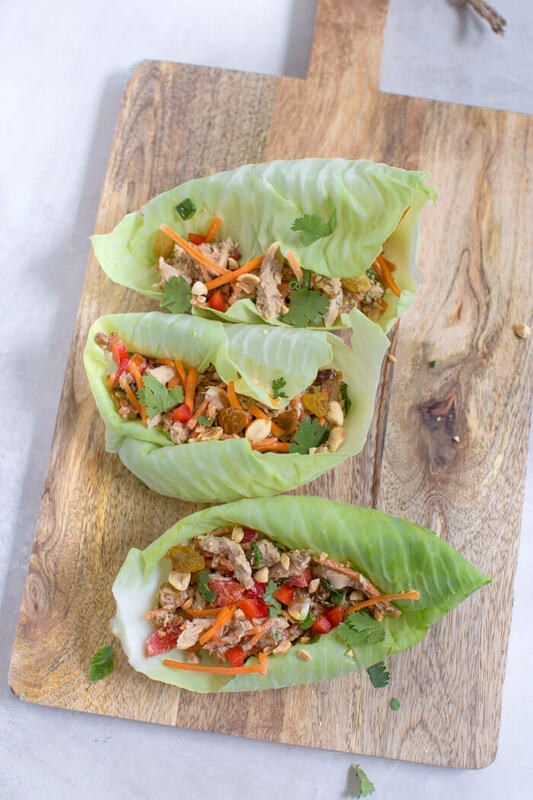 Thai Chicken Salad Lettuce Wraps! 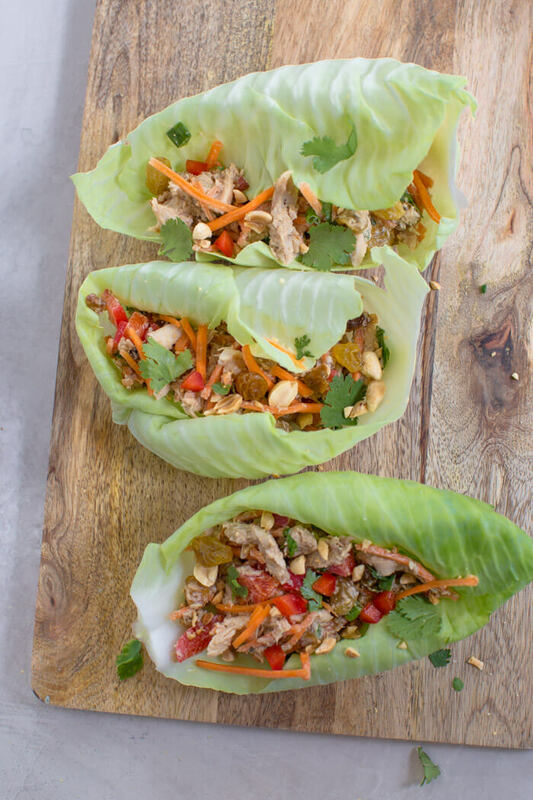 These lunch wraps are spicy and made with peanuts, a cold chicken salad recipe wrapped in lettuce. In a small bowl, stir together garlic, soy sauce, rice vinegar, honey, peanut butter and yogurt. In a separate bowl, toss together chicken, carrots, bell pepper, raisins, onions, and cilantro. Pour dressing over chicken mixture, and toss gently to coat. 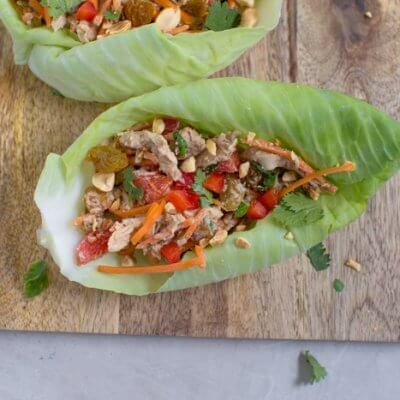 Serve chicken salad in cabbage leaves and top with crushed peanuts and a squeeze of fresh lime juice.